When people dial a gate, they generally enter from the 'front' of the stargate. For convenience's sake on most planets, the 'front' of the gate is defined as the end that faces toward the DHD. Its also the side that has the 'kawoosh' splash out effect. 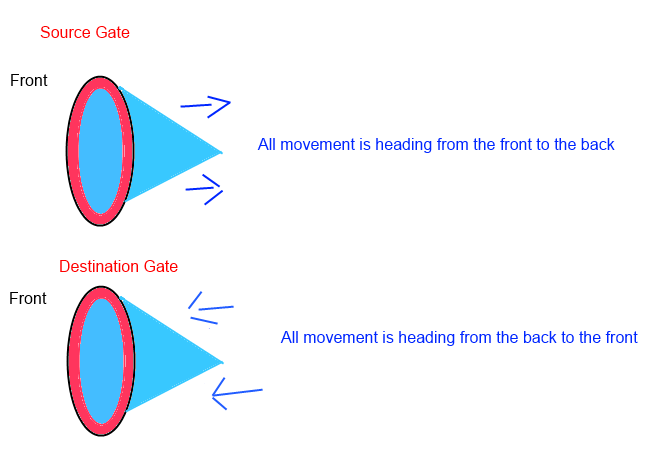 But what happens if an object entered from the 'back' (i.e., the other side) of an active gate? Note: I'm not talking about incoming/outgoing directions. I'm assuming a "we dialed out, now we're gonna walk around the gate and enter from the wrong side" scenario. The tie-in novel SG1: Survival of the Fittest addresses this briefly. "How about we just try it backwards?" Jack piped up again, though where he took the air from was anybody's guess. "Just because we've never done it before doesn't mean it won't-"
"I once knew a man who thought the same as O'Neill," Bra'tac reminisced dryly. "His death was most unpleasant." "Thanks for clearing that one up, Bra'tac. What do we do? Carter?" 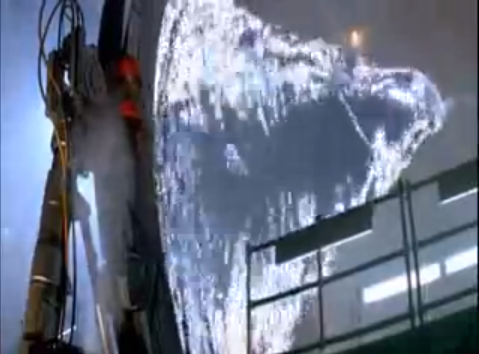 In the original Stargate movie we see a brief shot of the back of the Stargate just after it has been dialed. We can see that the Stargate doesn't have the dialers on the back. It's surface appears to be fairly clean. Which shows there is definitely a front side. The shot then goes back to the front view, which shows the classic water surface effect that is in your screenshot. 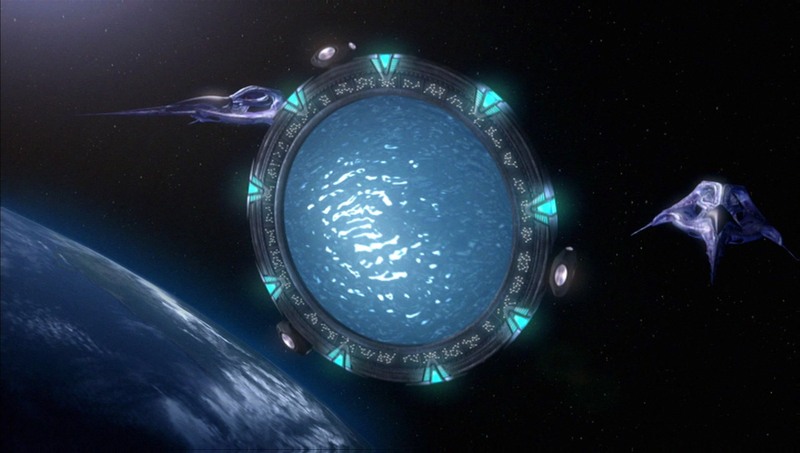 The back of the Stargate is presumably still a swirling spiral of water, focused down to a point (the point of the worm hole). I imagine attempting to enter from the backside would be like trying to swim up through a whirlpool. It could be figured that if you attempted to walk from the backside to the front side through the cone, you would be "pulled" backwards through the portal and out the "entrance" of the destination gate. Exiting from the backside of the gate would be impossible. Can you enter a Stargate from the back? How can a destination gate glow when being dialed? How do beam weapons pass through a stargate differently to Puddle Jumpers?